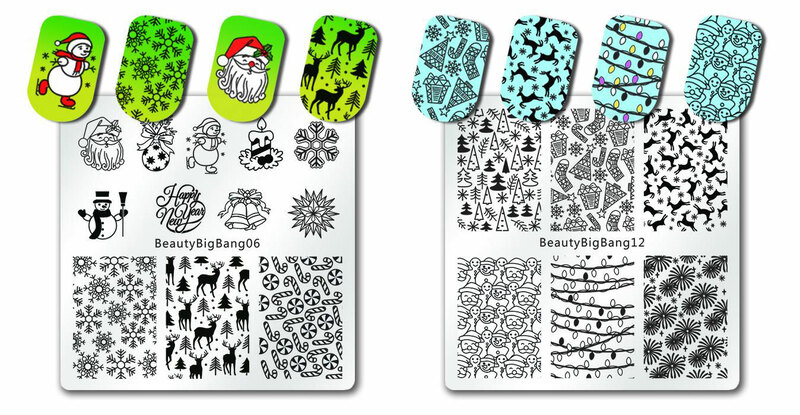 I selected a plate they’d released earlier (BeautyBigBang06) along with a newer plate (BeautyBigBang12). Both plates include images that can be used outside of the Christmas season, which is important if you have limited space/budget. BeautyBigBang12’s use easily extends out of the winter season. I think the tree and string light patterns are the most versatile overall, but even the fireworks can be turned into flowers with a dotting tool. The etchings are good, neither so deep that thicker stamping polishes smear easily nor so shallow that non-stamping polishes are completely unworkable (see last design). The metal is thick enough to not bend easily with no plastic backing. The edges aren’t perfectly smooth, but I don’t feel in danger of slicing my finger open either. 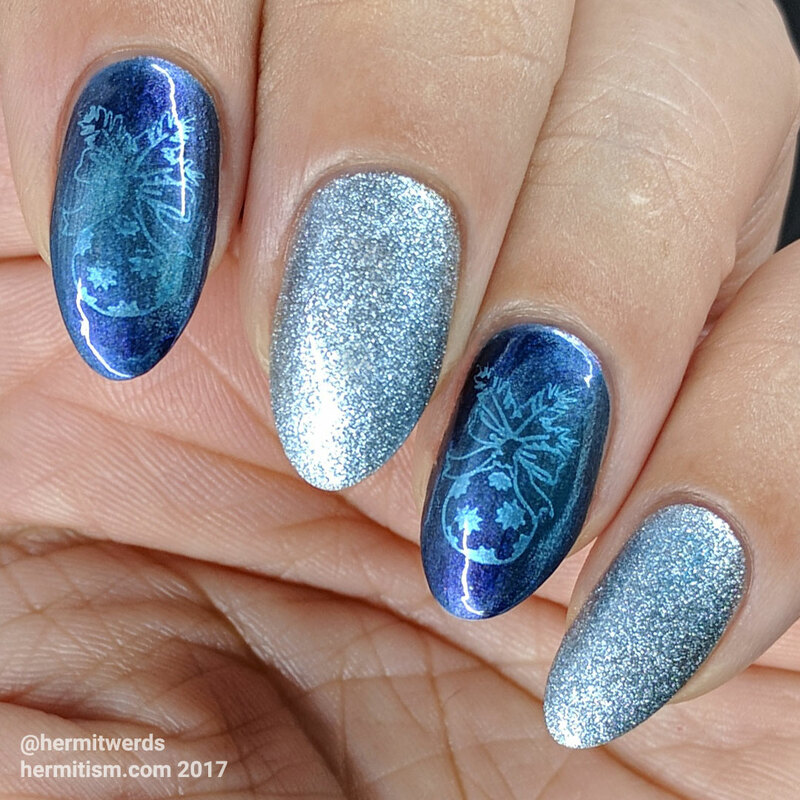 I wanted this design to be quick, subtle, and simple so the ornament’s stamping doesn’t stand out a whole lot from the dark blue polish. I then used a magnetic polish underneath for some extra umph behind the ornaments. This could easily be dressed up more with a Christmas charm or water decal on the middle finger or one could use a flat color and add an ornament decal with all the colors filled in. 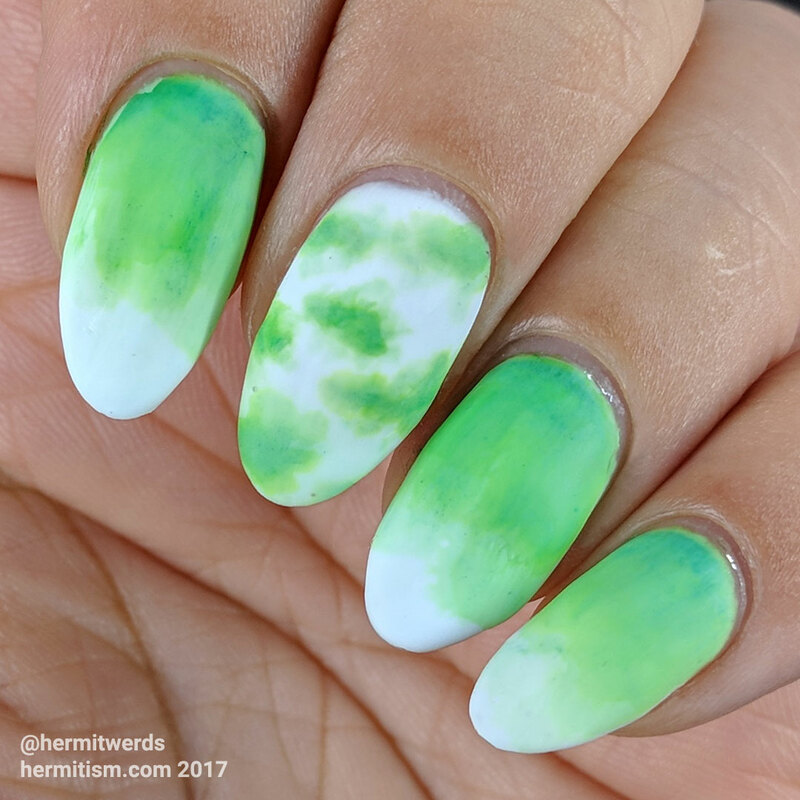 Now there is nothing about this nail art that says you have to use sharpie markers, but I wanted to see if a smooth wash of ink was possible if I used a matte top coat. Answer: yes! And it works with a more satin-finish top coat unlike watercolor paint which still had problems adhering to my nail. Possibly one could use rubbing alcohol with watercolor paint to the same effect, but I haven’t tried that yet. I stamped silver snowflakes directly on top of the blue and added another layer of white for the ground. 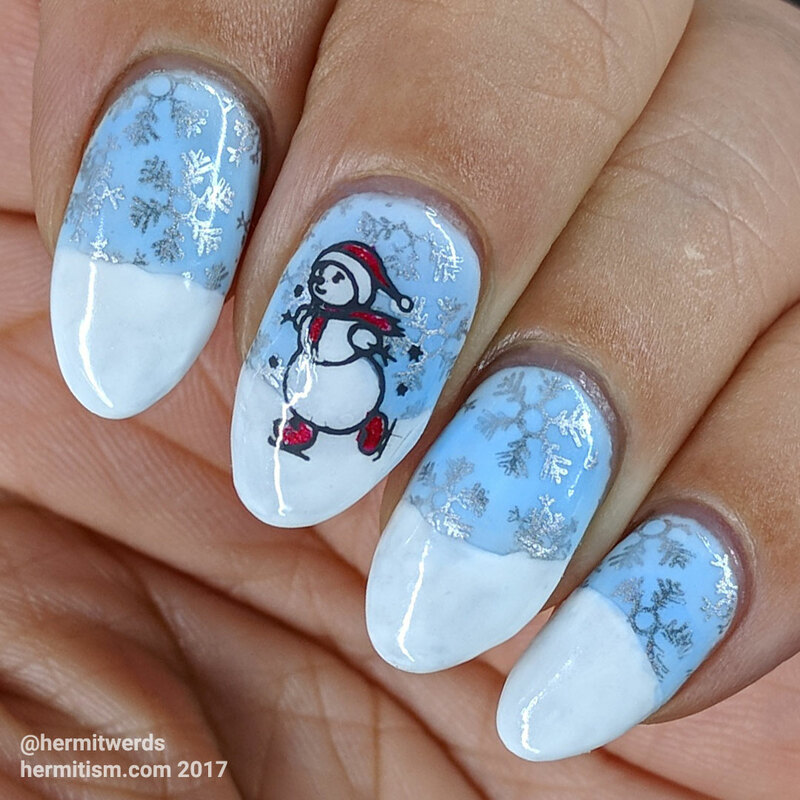 The snowman made a great little decal and since there is a second snowman on the stamping plate you could add that to your thumb for variety or flip over the skating snowman and make it look like they are skating together. Wow this nail art ended up being bright-looking. This time I tried creating a bit of a gradient with my wash of sharpie marker and it worked pretty well too. Just be very careful to not apply too much pigment at once because it does not blend out well with a matte top coat underneath. I also tried to create a kind of abstract tree backdrop for my string lights. Then I did some full nail stamping and created a decal out of the strings of lights by painting white matte polish in all the bulbs. Once the decal was on my nail, I colored it in directly with the sharpie markers. Bad idea. Without the dried rubbing alcohol to hold the pigment in place, top coat smears sharpie ink. I didn’t include a picture of my thumb, but I separated out some of the light strands so it wasn’t covering the whole nail. 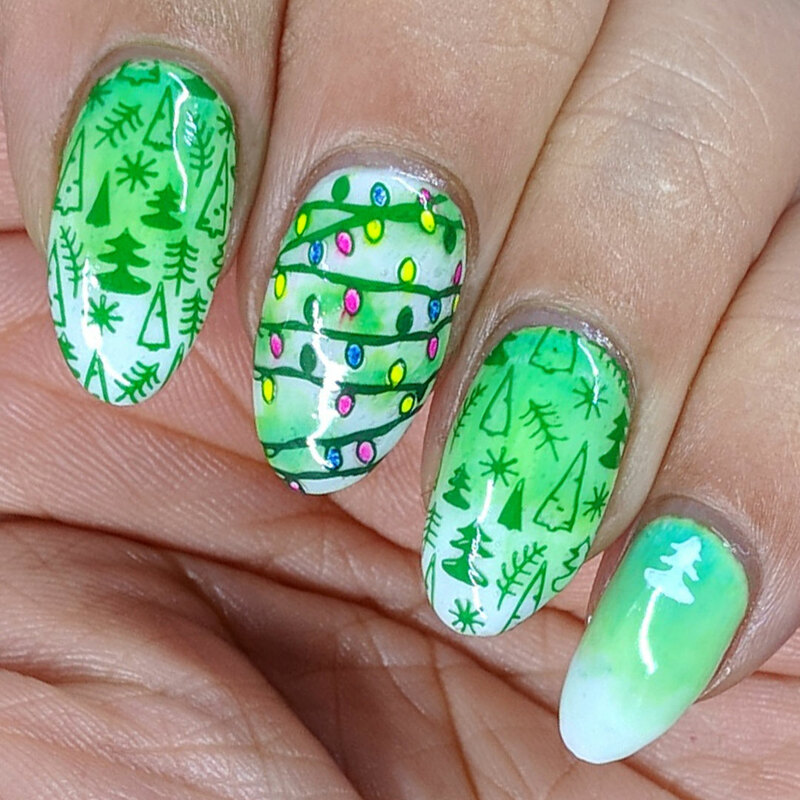 I also pulled a tree out of the full nail design to create a pseudo tree stud on my pinkie. I use that trick a lot. With this last nail art I decided to experiment with a regular polish that is not forgiving when used for stamping. I used to use this as my dark brown before I got my hands on Essie’s “Partner in Crime” (also it smells like yummy chocolate). The light colored deer were stamped with a proper stamping polish so you know the plate works well. I did get pretty decent results on my index finger with the too-thin polish, but you can see on my pinkie finger that it will likely take you several tries if you want a clear stamping. 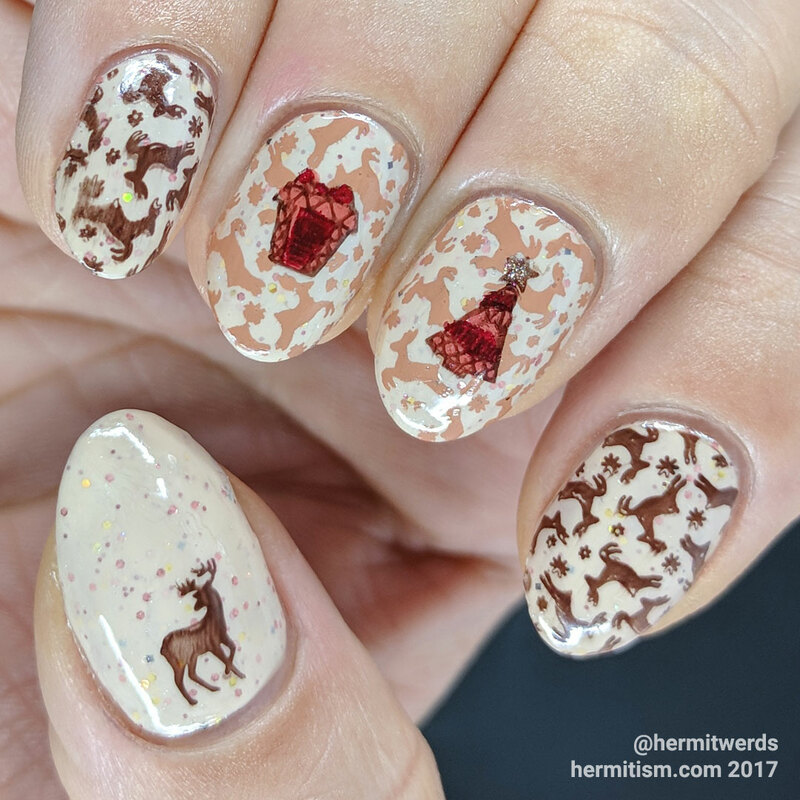 Still, the etchings are deep enough that it’s possible and even the larger deer turned out okay even though there was no way it was going to be fully opaque without double stamping. TLDR: Plates worked good. Me find useful. 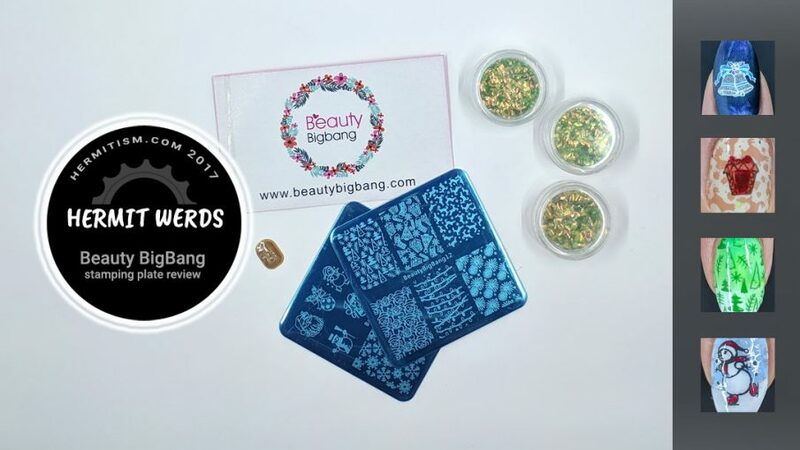 Use discount code hermi for 10% off your entire order at Beauty BigBang (BeautyBigBang06 and BeautyBigBang12). I do not receive money, only the chance to have a giveaway for you if enough people use it.